Parking permits in Gothic are mandatory and need to be bought per vehicle. We recognize that research groups need vehicles to access sites and that people living offsite need a way to travel to and from Gothic. We charge people for parking a car at Gothic because there is a real cost to having cars here, for example meadows and green areas have been converted into parking areas. Charging a fee encourages people to decide how important parking in Gothic is to them. Items which are free, or shared by the commons, tend to be undervalued and we want our meadows to be valued. We want people to be thoughtful about whether having a car onsite is a priority. Everybody driving a car to Gothic for research, education, or work needs a parking permit. 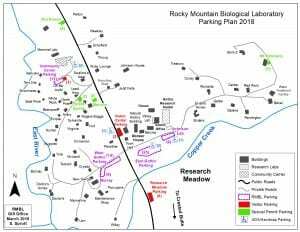 As a condition of working through RMBL we do not allow over-night parking on the county road or at Judd Falls parking lot in order to avoid paying a parking fee. We have arranged free parking in Mt. Crested Butte at the Snodgrass trailhead. Parking on non-RMBL private property close to Gothic is by permission of the landowner. All RMBL Users parking in Gothic will need to park in a designated parking zone and display a parking sticker or temporary parking permit on their vehicles. Parking on the County Road in Gothic, at the RMBL Visitor’s Parking Lot south of the Copper Creek bridge, or Forest Service Land within 1 mile of RMBL is a violation of RMBL parking policy. Individuals caught parking on Gothic Road within the 1 mile limit will be warned one time and then fined $50.00 per violation. Parking on Gothic Road is for the general public only. Parking fees are in effect between June 1 and August 24. Parking is free outside these dates but vehicles must still be parked in assigned locations only. There are separate parking rates for Principal Investigator (PI) Research Vehicles and for Student/RA/Guest Vehicles. PIs can purchase parking permits at the ‘Research Vehicle’ rate for vehicles that are used by the research team, regardless of who owns the vehicle. This is allowable on the condition that the vehicles are primarily used for research. Parking permits may be transferred between individuals; for example, between members of a carpool group or from a PI to members of his or her research team. Scientists owning vehicles through RMBL are required to pay parking fees in Gothic. Parking assignments will be made by the RMBL Administration Office. Please contact office@rmbl.org to make reservations. Parking assignments will be made on a first-come, first-served basis. Commuters and residents not expecting to park in Gothic on a daily basis may communicate with the Operations Coordinator how to track and report their days. Parking will be assigned to our main parking lots only. Limited parking at cabins will only be available with special permission from the Director of Finance and Operations or the Executive Director. Free Parking is available in Mt. Crested Butte, at the Snodgrass Trailhead. For a PDF of the parking map below, please click here.